by Jessica Lewis	Posted in	Face	on 24/07/2017 . Having great pores can seem like a challenge at times. when we’re born, our skin is smooth and seemingly flawless but, as we grow up, our pores become a lot more visible. Pores are, simply, opening in your skin where hair grows and where natural oils are released onto the surface. What is Obagi CLENZIderm MD? This product is a daily care foaming cleanser best suited for normal to oily skin. It’s different from other products because it’s formulated with proven acne-fighting ingredients, including a patent-pending 5% liquefied Benzoyl Peroxide formula. This cleanser was created with you in mind. It facilitates natural exfoliation and reveals healthier skin, so it decreases bacteria build up and impurities that cause spots. The Obagi CLENZIderm MD cleansing foam infiltrates your follicles deeply, where the acne starts, and clears it more effectively than other acne treatments. This can help you to improve the appearance of your pores. This product removes dirt and excess oil with 2% salicylic acid, which leaves your skin clean and feeling refreshed. The menthol in the formula helps to soothe and cool irritated skin. For best results, you should use this cleanser every day. This can help you to reduce visible signs of acne and prevent breakouts while maintaining healthy skin. First, you should wet your face with warm water. Then, dispense only a dime-sized amount of cleanser and lather and massage it over your face for 20 to 30 seconds minimum. You can then rinse your skin thoroughly and dry it. That’s it. 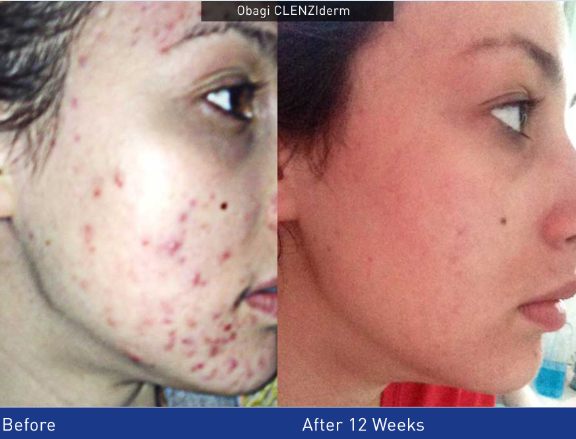 You can start enjoying clearer skin and improved pores with a routine of Obagi CLENZIderm in no time. For even better results, combine this treatment with Pore Therapy and Serum Gel. How Can You Benefit from this Cleanser? This product can help patients with normal to oily skin to see a 52% reduction in sore red acne and a 34% reduction in whiteheads and blackheads within the first two weeks of use. For normal to dry skin types, the reports point to a 505 reduction in sore red acne and 29% reduction in whiteheads and blackheads. This means that you can expect a clearer and healthier complexion in just a few weeks by using the Obagi CLENZIderm on a regular basis. We understand that enlarged pores might not be your favourite thing ever, which is why we provide you with products that can improve their appearance. They, in turn, will help you to feel more confident in your skin! We’re here to answer any queries you may have about our products as well, so get in touch with us if you wish to discuss any of our skincare brands and what they can do for you.